Ashoka Trust for Research in Ecology and Environment (ATREE) is built on a strong academic foundation and actively pursues investigations in the natural and social sciences, which form the basis for ongoing projects that are dedicated to outreach and education. The Kalakad Mundanthurai Tiger Reserve (KMTR) , and the Biligiri Rangaswamy Temple Wildlife Sanctuary, two important protected areas in India’s Western Ghats, have been long-standing foci of ATREE’s work in forest ecology. They have also undertaken a pioneering canopy research program at KMTR which is opening a new world of ecological understanding. We at the Canopee Project have identified that collecting data on these covariates could be very easy, most precise and regular if an efficient Sun SPOT system could be developed. The project specifically aims at developing a sensor solution which will be tested and deployed at KMTR. See Canopy Research for more details. 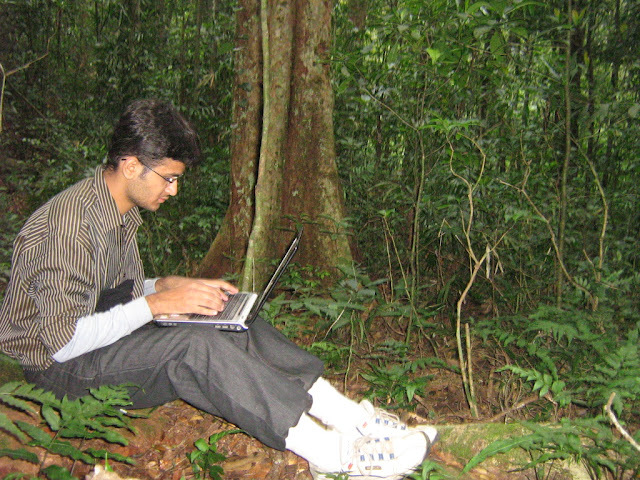 We've recenlty been to the KMTR Rain forest for a possible deployment solution using Sun SPOTs. Here is a brief account of how Sun SPOTs actually fared in these XTreme conditions! As a part of the project, they need to measure various environmental variables, such as temperature, light, rainfall, soil moisture, if possible CO2 etc. Since they do long term monitoring at the site for vegetation, phenology and soil moisture levels the equipments need to run unattended for months together. The equipments should also be small, completely water proof - usually moisture levels are 100% for a large part of the year. 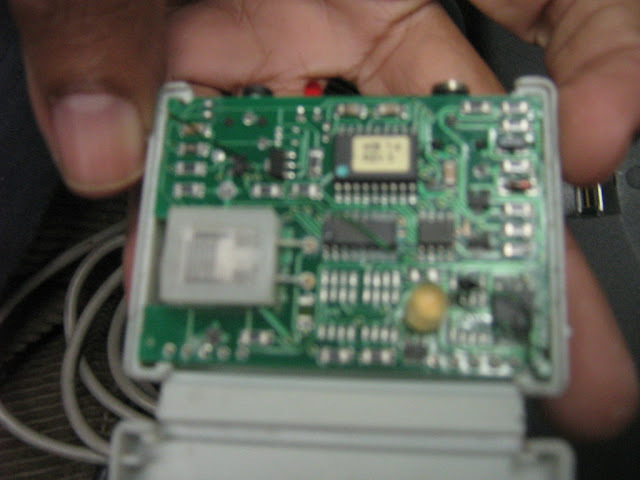 Many dataloggers have failed due to moisture. Hence, a reliable, moisture resistant sensor network is needed which will measure the required parameters efficiently. They deploy the data loggers on tree tops about 22 - 25 mt high. They periodically have to climb up trees and bring the dataloggers down. So, it would be really useful if the system could send data down wirelessly if base station connected to the computer is in range.The data can then be stored in database and analyzed to generate reports. But theory sounds really good. What about practical deployment and feasibility? We analyzed many important aspects. Here is what we found. Issue I: How to protect the Sun SPOT in such hostile conditions? Animals - specially monkeys. 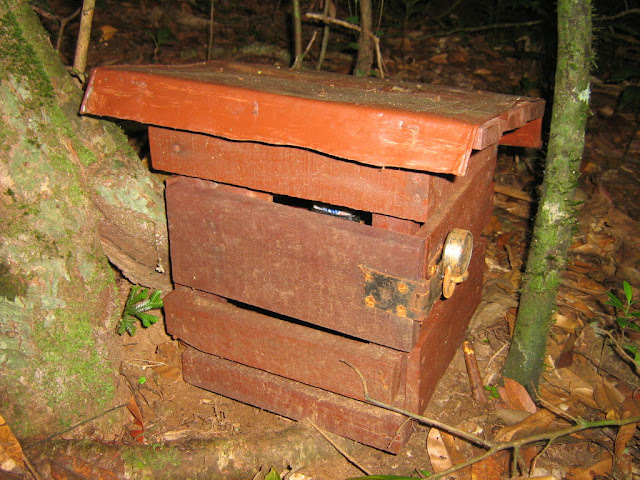 One of the data loggers was actually chewed away and destroyed by a Nilgiri Langoor! But the solution was already in place! 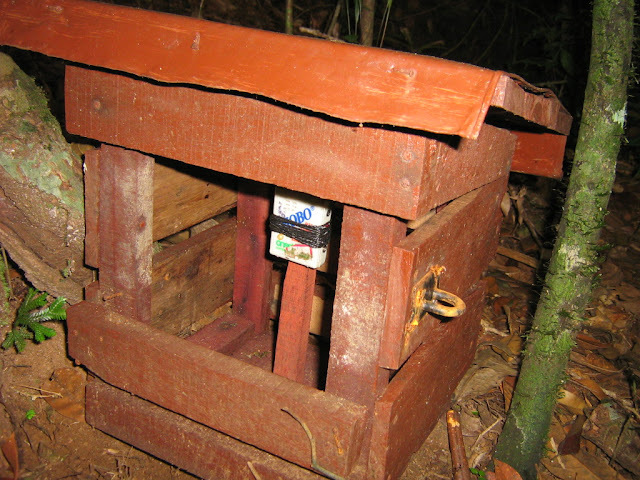 They have developed a nice little box that keeps the data logger away from Rain and water splashings from sides. Also they lock it away so that the animals can't get their hands on it. The device is suspended from the middle and slits are provided so that the temperature and moisture are not altered. Issue II: The accuracy of the data? We've developed a prototype of the probable system for testing. The Sun SPOT was kept on the tree for 1 day and programmed to take 48 readings of light and temperature at intervals of 1/2 hour each. Later it would send the data to database through basestation. The actual result was fantastic! We placed the Sun SPOT besides the hobo data logger inside the box and the readings found were almost matching. The slight deviation of 0.5 units was completely acceptable. Issue III: Range of Sun SPOTs! Inside dense forest with thick foliage between ground and tree top. 22 m but not very clear. We had to move about to get clear range. Inside forest with little foliage between ground and tree top. Dr T Ganesh (ATREE Scientist) and Us. Last ditch Code Changes!